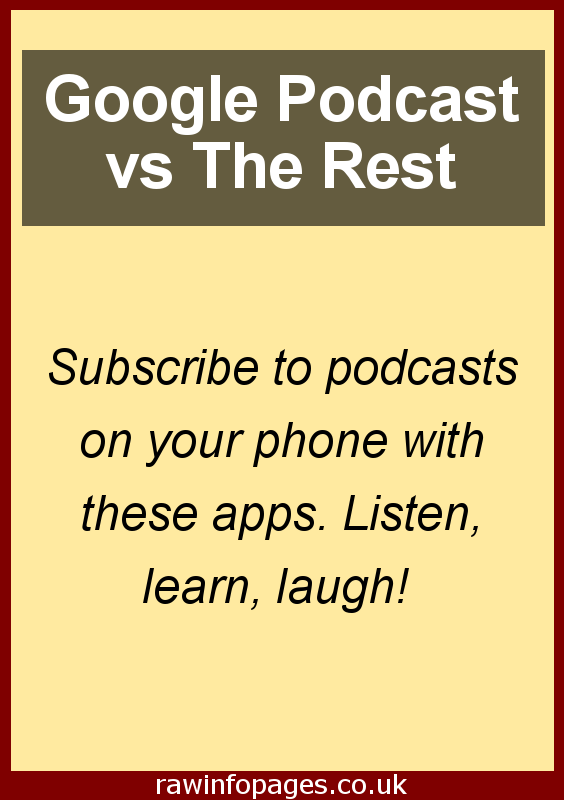 Google Podcasts – too little too late or a breath of fresh air? Podcasts have been around for years, decades even, so why is Google so late to the party? Let’s look at the Android app and also see how it compares to a couple of established apps. A podcast is a series of audio or video files, usually audio, that you subscribe to. They are basically like recordings of talk radio shows and new episodes are often released weekly and you can download them to your phone and listen to them with a podcast app. 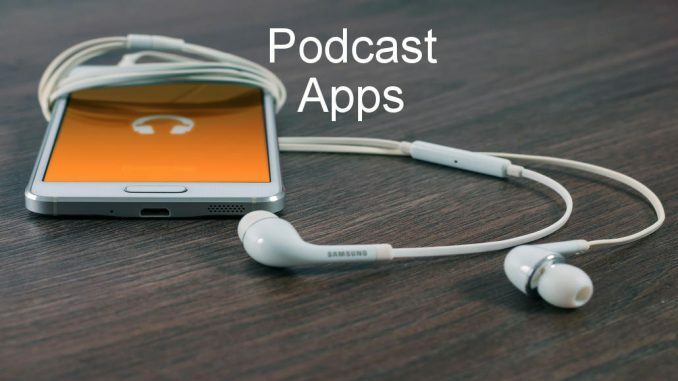 Some podcasts are produced by commercial companies and the content can be taken from other publications like newspapers and magazines, highlights from the web, radio, TV, or they could contain original material. Some podcasts are re-runs of previously broadcast radio shows and so are top quality. Other podcasts are produced by enthusiasts and they build up a following of like-minded enthusiasts. There are some excellent ones with huge followings. Podcasting really took off in the early 2000s, especially when Apple added support for them on the iPod. When smartphones came along, they had all the audio playing capabilities of the iPod and today your phone is the best place to subscribe to and listen to podcasts. A search for ‘podcast’ on the Google Play Store produces a list of apps that go on and on. There are dozens and maybe even hundreds. There is no shortage of podcast apps to choose from and there are some excellent ones, so why has Google decided so late in the day to produce one of its own? The same could be said of web browsers and Google came along with a bare bones browser that was simple and fast. Now it dominates the browser market. Will this happen with podcasting apps? It is certainly possible and Google Podcast is emulating Chrome with a cut down basic app that is basic, but easy to use and fast. There are too many podcast apps to review them all, so here I have chosen three examples that are very different. A basic app, a beautiful app and a feature-packed app. Each will suit a different person. At the top of the home screen of Google Podcasts are your subscriptions displayed as thumbnail images. Below these are three tabs and these show new episodes of podcasts you are subscribed to, those you are currently listening to, and downloads. At the bottom is the podcast you last listened to and it shows the minutes left. Tapping any of the play buttons lets you start or continue with a podcast. There are buttons to skip back or forward a few seconds and the playback speed can be adjusted. I find some podcasts are slow with long pauses and I listen to them at 1.1 speed. This is very simple, very basic, but also quite good in a way. I like the clean design and it makes it very easy to see new podcasts and to finish ones you started listening to or to start new ones. There are options to automatically remove completed episodes or ones you have abandoned and this reduces storage requirements. A minor issue I have with it is discovering new podcasts. Swipe up and there are sections for top podcasts, trending podcasts, top podcasts in comedy, society and culture, news and politics and so on. It is very easy to browse them and there are thumbnail images, titles, episode lists and subscription buttons. Subscribe to podcasts and it suggests other podcasts that are similar or which subscribers subscribed to. It is nice as far as it goes but it is too limited. Looking at the app you might think that there are no more than 100 podcasts in the whole world when in fact there are thousands. The only way to discover podcasts beyond the small number that are highlighted is to use the search facility. It is a bit like Google Play Store and Apple App Store. There are millions of apps but only a select few are highlighted and the rest are hard to find. 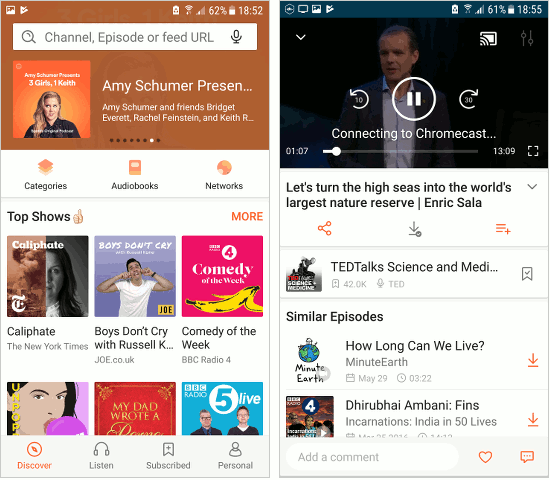 Some people have complained about the lack of features in Google Podcasts, such as a sleep timer, auto-downloading of the next episode of podcast subscriptions, and notifications of new episodes. It is a bare bones player and it does not pack many features. It is a tiny app and is just 200k or so installed, which is because it relies on other Google apps and services for certain functions. I had to update the Google app before installing the Google Podcast app for example. Overall, I like the simplicity of Google Podcast but some people won’t. Podcast Republic has been my podcast player for a long time and where Google Podcasts lacks features, this one has tons of them. Everything you could want in a podcast app is here and it is brilliant in almost every way. It plays radio stations and audiobooks and it even has a car mode with a simplified screen with big buttons and simple gestures for controlling playback. It has timers and alarms, an equalizer for customising the sound, variable playback speed, themes, night mode, and even left or right-handed operation, to mention just a few features. The settings provide detailed control of everything and in the Downloads section for example, you can turn on auto-download, choose how many episodes are downloaded, enable a smart download option, download only when charging the phone, limit downloading to set hours of the day, multithreaded downloads and how many downloads to keep. That’s just one section in the settings and there are many more equally detailed. This podcast app is all about features and options and it has countless ones that Google Podcast doesn’t. You could spend 20 minutes just configuring Podcast Republic. Discovering podcasts is better than with Google’s app. It has three tabs and there are featured podcasts, popular podcasts and a category tab with 16 categories. Within a category are dozens of podcasts, far more than in Google’s app. There is also a podcast search feature that works well. This all makes it easier to discover podcasts you might like. It’s ad-supported, but they aren’t a problem and you can pay to remove them. I could easily fill this page with all the features in Podcast Republic and it looks like the developer’s aim is to simply have more features than anyone else. It is a first-class app for people that want to control everything and like customising settings. Castbox is different to Google Podcast and Podcast Republic and the focus here is clearly on design. It looks fantastic – better in real life than in the screenshots. 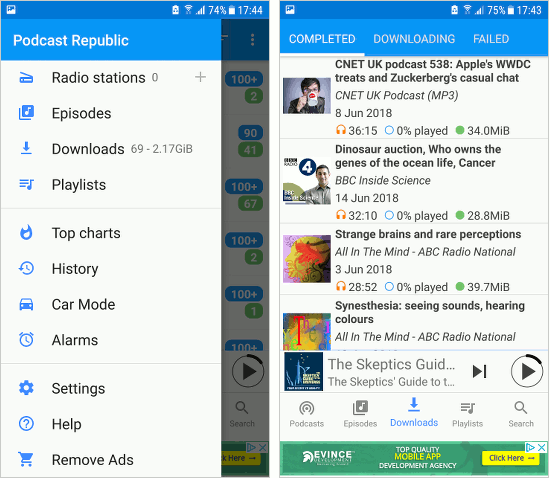 The app sits in the middle in terms of features and it has more than Google Podcast, but fewer than Podcast Republic. Finding podcasts is easy and there is a discover section that has podcasts organised into 17 categories. Select any section and there is a very nicely presented list of podcasts that runs on and on for many screens. You can view episodes, details, comments from others, and subscribe. You can also browse by networks, such as NPR, BBC, The New York Times, Fox Sports and many more. There is an Audiobooks section with a selection of free audiobooks you can download and listen to. There are many classics from 50 or more years ago that you meant to read but never got round to. You can view trending podcasts, your own subscriptions, and downloaded episodes. Episodes can be downloaded manually or they can be set to download automatically and you can choose how many episodes to keep. You can skip forward and rewind a little, boost the volume and set the playback speed. A useful feature for some is the ability to send the podcast to the TV if it has a Chromecast attached, which is nice when it is a video podcast. Another unusual feature is the podcast creator and you can create a channel and record your own podcast episodes. This is a beautifully designed app that has enough features for most people. There isn’t really a winner here and the three podcast apps are very different. Each one will suit a different type of person. 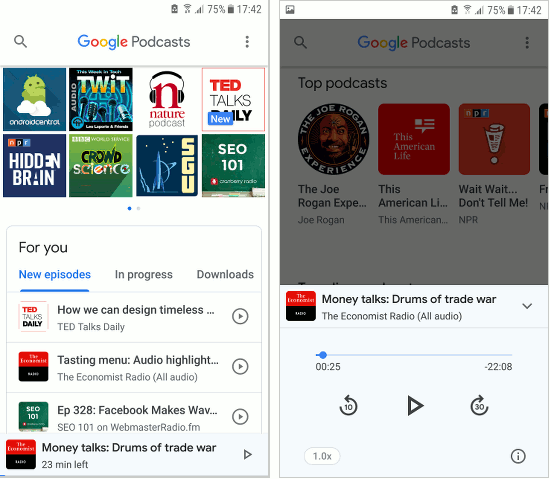 Google Podcasts offers basic podcast features and a very simple app. The interface is clean and uncomplicated and you can find podcasts reasonably easily. For those that need more features and want a particularly nice design that looks great, Castbox will suit you. The discovery section is very good and you can browse hundreds and maybe thousands of podcasts but if you can’t find what interests you, there is a good search facility too. If you want a podcast app with every feature imaginable, Podcast Republic is the one to go for. It packs in a huge range of features and you have a fine degree of control over every aspect of the app, from the sound quality to the subscriptions and downloads. I’m a HUGE podcast fan. Literally listening to one by Parcast right now. But I had no idea google didn’t have a podcast app! That’s nuts! These sound like great options for people with andrioids!